People really love Facebook advertising, because Facebook makes it easy to find the right people, capture their attention and get results. As you might know that, More than 1.8 billion people use Facebook every month, and you can find the potential buyers concerned to your services or product online by advertising on Facebook. You can choose your audience based on demographics, behaviors or contact information. How pay to Facebook from Pakistan without credit card? You can pay to Facebook from Pakistan using credit cards or co-branded debit cards. Facebook also accept manual payment methods and payment through PayPal. You can pay to Facebook through your Debit Card provided by any of your bank, mostly all Debit Card works perfect on Facebook, but still some debit cards are not working for online payments, we are going to mention few which we have tried and works. Wait, Don’t you have any one of these cards? Don’t worry, Read below, we have solution for you. Your Pakistani Debit Card is not Working on Facebook? If your Pakistani debit card is not working on Facebook for advertising, Do not worry, we have solution for you. Advcash.com provide Virtual Debit Cards on your own name which you can use for payment to Facebook within Pakistan. 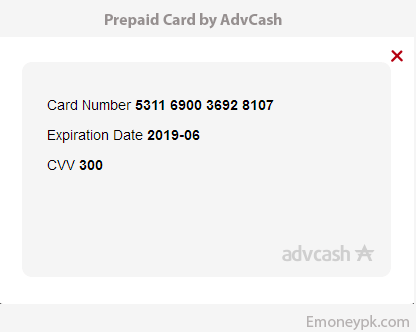 You can create your own Virtual Debit Card on your own name using Advcash, You can easily load your Advcash Debit Card using PerfectMoney, Payza and many other payment methods. We do also offer Advcash Top-up and Withdraw services in Pakistan. You can easily buy Advcash fund in Pakistan from us. 4. Billing Address will be the same provided by you to Advcash during Signup. Whenever you add your Debit Card on any websites for payment, Websites do charge basic fee for verification of your Debit Card, You should add minimum $5 in your Debit Card to Attach and use it on Facebook. Payza also offers Prepaid Debit Cards to verified account holders, You can use easily use Payza Prepaid Debit Card on Facebook for payments, You need to verify your Payza account to get Prepaid Card, Unverified users cannot create Prepaid Debit Card in Payza. Want to Add Fund in AdvCash Account? Minimum 20$ you can buy from us. Submit Your OrderBy following above information, You can easily pay to Facebook for advertising, We have tested these cards on Facebook for advertising and they work very fine without any problem. We have NO direct or indirect relation with advcash or any other Debit Card provider, if any Debit Card or Services not working for you, you will need to ask to the concerned provider, not to us. AdvCash is no longer offering cards. Facebook wont accept my HBL debitcard despite the test charge going through. Is there any working solution? have you tried SCB Card? This credit card can’t be set as your account’s primary payment method because your account has been set up to be billed after your ads have delivered. This setup can’t be changed. Please try a different card or payment method. Please try SCB, standard chartered account. I am having the same issue I am trying UBL premium debit Mastercard, but the real question is when Facebook claims that they accept credit cards and some co-branded debit card i.e MasterCard or visa then why do they show this error. Check with your bank if they required online session to be activated before making online payments, like now a days happening with many bank cards, Allied and many other bank asks you to activate online payment session before making payments, you can active it by calling on concerned bank help line. when i boost a post direct from page it works, but when i create ad from ad account , facebook does not accept the debit card. This is a great method, however, I think UBL Wiz Card works just fine without any hassle. There is a limit on daily usage though. I want to advertise my business in Pakistan/Gujranwala i was just looking for some help. these are only virtual cards or we can get physical cards also? These are virtual as well as Physical, For physical card you will need to verify your account at advcash, however virtual card you can get without verification. its really good.. can i add fund from my dedbit card in advcash? Yes you can, Not direct to Advacash, But you can use your Debit Card/ATM Card to send us PKR, we will send you fund in your Advcash. You will need to submit your order. I need vcc which works on adword, Let me know. We have shared a method which can help you, now trying it is in your hands, give it a try with minimum balance. verification required for card or not? No, Virtual cards you can create and use without any verification. of course it is trusted, that is why we have shared it in public, we have tested it ourself. Can i use these prepaid cards to verify my google adwords account and facebook advertising account? Yes you can, Add at least 10$ in card to use on websites.